Are you searching for new step vans and having problems locating a list of reputable Florida Step Van Dealers? Used and price-conscious step vans? Step vans with a reputable warranty? Step vans ready for food truck upfitting? Step vans that are ISP ready? Check out this article on some of the top Florida step van dealers. Step van dealers can be found in many states but not all dealers are created equal. With the help of bloggerlocal.com, we’ve located a list of the top-rated and reliable step van dealers to narrow down the search time and effort. Below is a list of step van dealers that serve the state of Florida. Debary Truck Sales is located in Sanford, FL and specializes in one owner, salt-free, rust free truck everything from box trucks to reefer trucks, medium duty to commercial trucks and many others. You will not find an auction truck or a rental truck here at DeBary Truck Sales. Our goal is to make sure that you do not inherit someone else’s headache and that is why our new and used commercial trucks go through a 31 point inspection prior to going up for sale. Our buyers have more than 60 years combined experience purchasing vehicles. Serving the East Coast including New York, Miami, and Orlando, Florida; Toronto, Canada; Panama, Chile, Argentina, Puerto Rico and South America with new and used commercial trucks. Shumate Truck Center is located in Tampa, FL and is family owned and operated. They have been in business for 57 years, and customers deal directly with the owners. Longwood Truck Center is a family owned business and has been serving Central Florida since 2004. We are authorized agents of Budget Truck Sales Center. Our commitment is to offer some of the best values on used and off-lease commercial vehicles throughout Central Florida. Longwood Truck Center proudly serves the communities of Daytona Debary, Deland, Deltona, Sanford, Longwood, Winter Springs, Casselberry, Altamonte Springs and Orlando. Our commercial vehicle sales consultants specialize in diesel and gasoline powered Box / Straight Trucks, Cargo Vans, Cube Vans, Crane Trucks, Cutaways, Dump Trucks, Plumber Utilities, Rollbacks, Spartan Utilities, Step Vans and Bucket Trucks. Our preferred manufacturers include Chevrolet, Dodge, Ford, Freightliner, GMC, Grumman Olson, Hino, International, Isuzu, Mitsubishi Fuso, Sprinter, Sterling, and Workhorse. This is the biggest new and used step van dealer in the country, with a significant customer base in Florida. MAG Trucks keeps a huge inventory of vehicles in stock at all times, offering a wide array of years, mileages, and programs that meet the demands of customers. From P500 – P1200, gas and diesel options, MAG is known for making the truck buying experience quick, and easy. Beginning in January 2017, MAG is under new management, and offers finance options for an all-in-one transaction. Check out their inventory – www.magtrucks.com. Located just outside of the Kansas City, Missouri area, this company serves businesses throughout the U.S.
As a company listed on this list, MAG Trucks has spent over a decade in business and continues to focus on top-notch customer service and a positive truck buying experience. From our in-house 50,000 sq. ft. fabrication facility to ISP guidelines, MAG Trucks is centrally located and equipped to easily deliver step vans nationwide within 7-10 days of purchasing. 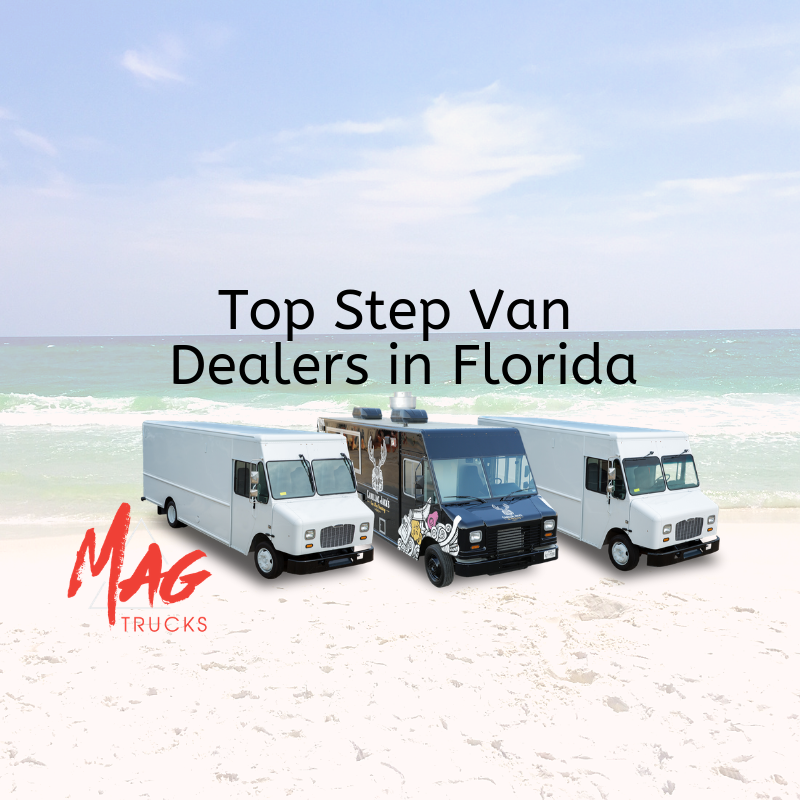 In fact, many of our repeat customers are located in Florida and find the experience with MAG to be such an easy and flawless process that the distance of delivery offers no deterrent when purchasing a single step van or fleet of step vans. In addition, the selection of the companies ranked on the mentioned list below offered a wider selection of both new and used step vans. This is a core differentiating factor between step van dealers and purchasing from eBay or craigslist.